When Trader Joe's opened I didn't really get all the hype. I was skeptical at first - but I'm now a weekly shopper and our list of favorites gets longer every time we go. Today I thought I'd share some of our favorite things to pick up at Trader Joe's! Our Trader Joe's isn't super convenient to our house, but is right across for GG's dance studio, so we pop in almost every Saturday after her class. Sorry that some of my pictures are turned sideways! I can't get them to change! ARGH!!! I'm a big fan of the Trader Joe's salads. The Southwest salad is my current favorite - it's loaded with yummy veggies and the dressing is amazing. Bonus points it's around $3.50. I typically add some avocado or grilled chicken on top and I'm good to go. NOBODY has better cheeses than Trader Joe's. I feel like I've eaten my way through the cheese section (well... not quite, but I've tried a lot of them) and am yet to be disappointed. ... and their low fat cheddar cheese sticks make their way into my lunch bag almost daily. ... and the "Pita Pal" organic hummus is my favorite by FAR! The roasted garlic is sooooo good!!! ... and the dark chocolate peanut butter cups are my perfect afternoon pick-me-up. Our newest favorite is the BBQ chicken teriyaki and jasmine rice. The chicken is $5/bag and the rice is $3/box (which includes 3 bags) and you make both of them in the microwave. One bag of chicken and 2 bags of the rice was ready in under 15 minutes, was enough to feed all of us and my kids LOOOOVED it! I always know things are a hit when my boys ask to take leftovers in their thermoses for lunch the next day. There weren't any leftovers, but we were able to make another bag and portion it out for lunches the next day. This Mandarin Orange BBQ chicken is incredibly tasty over rice as well. ... and this pasta sauce is AHHHMAZING!!! Last week I used it over their fresh tortellini and it was awesome. And these are their current favorite dessert treats. These flowers were for Homecoming court - so more than $6 but GORGEOUS! We've been using their sunscreen this Spring and so far so good! I love how "non-greasy" it is and it sprays on evenly and has covered my kids well during baseball and lots of outside time. So, there you go! Current TJ's favorites! If you have a favorite that I need to try out leave it in the comments! This may be my favorite post ever!! (just kidding lol!) But I love me some Trader Joe's. We live about an hour and a half from one so we make a monthly trip! Also I think people either love or hate cookie butter! I eat it by the spoonful or dip pretzels in it :). I was just like you - I didn't get the hype and never really went to Trader Joes, until I did, and now we buy so much their each week! I love their peeled and cooked beets (I chop them and put them in salads). The Mandarin Chicken you talked about is a favorite in our house. I can't wait to try the BBQ Chicken Teriyaki. I love the fresh salsa and guacamole. My kids devour their frozen string beans and edamame. Their frozen party-size turkey meatballs are great for spaghetti and meatballs and I use them in soups as well. We love their tortilla chips, frozen appetizers, turkey burgers, French fries, and I'm a big fan of the oatmeal in the freezer section. As for cookie butter, I don't really get eating it plain, but I use it as a substitute for peanut butter (due to my daughter's allergy) when baking. Cookie butter cookies are soooo good. Here's our favorite recipe - http://mcculloughfive.blogspot.com/2013/12/cookie-butter-blossoms.html. I also make cookie butter chocolate chip cookies. So delicious! I'm allergic to peanuts too and I really enjoy cookie butter on Ritz crackers and on bananas! I've been in that Trader Joe's twice! I haven't found anything we can't live without and the thought of another grocery store every week-ugh!! But maybe these are the items I should be buying?!! Cookie Butter is my favorite with apple slices! YUM! I loved the dried mangoes!!!! I typically buy three packages at a time. And have you ever had their sesame crunch cashews? YUM! And you can't beat a Trader Joe's orchid. I loved this post!! This makes me want to go to Trader Joe's TODAY to try some new things!! We don't have a Trader Joe (except two hours away in Nashville)...but I read somewhere that Aldi has the same parent company, and I am having a love affair with Aldi lately! I have always wondered what the big hype is over Trader Joe's as well. I don't have one local to me, so I have never been to one (closest one is 3 hours away). After reading your post, I wanna go to one NOW!!!! HAHAHA!!!! Thank you so much for the list of TJ faves. We have one pretty close, and I'm always looking for new things to try. Have a wonderful Wednesday! Cookie butter on pretzels!!! Delish! My kids became obsessed with the chocolate waffles that were a holiday special. Well I mentioned to the sweet lady at TJ that were we were sad they were gone. She gave me the Belgium waffles and a jar of cookie butter as a substitute and my son can not get enough! I don't like the cookie butter either but my son does on those waffles!! Oh my goodness Trader Joe's is the best! Did you know none of their snacks or food have anything artificial! My kids love the fish gummies that you can usually find at check out. If you love cheese try the carmalized onion it's amazing!!!! Delish on a grilled cheese. Also the plantain chips are a fav here. I could go on and on. I hope you get some yummy suggestions! Thank you so much for sharing. I always feel so lost when I go into Trader Joe's so this really helps! The Iced Green Tea Lemonade is amazing! I always have at least 2 in the pantry so I am never out. And the cinnamon graham crackers, frozen french toast and frozen steel cut oatmeal. Trader Joe's is my happy place. I was just commenting on Shay's post about how much I miss Trader Joe's! I love their green tea mints and green tea mocchi (I can't remember exactly what it's called...) ice cream. Just one really satisfies that dessert craving! And the samples in the store are always fun, too. Last 4th of July we got some cookies with popping sugar and they were really good! Cookie butter on toast! YUM! Also, you need to try their chili lime chicken burgers in the frozen section. They are flavorful, packed full of protein, and while they have a kick, they aren't too spicy for the kiddos. Love their frozen cauliflower rice sections, too. Cookie butter is awesome with pretzels. The salty and sweet together is the best combo. The sweet chili sauce, riced cauliflower, roasted red pepper and eggplant spread, and hold the cone mini ice cream cones are all favorites around these parts! We drive an hour to Trader Joe's once a month! We've been in Whole30 the past month, but they have so many good things. I love the sesame peanut dressing in a bag of coleslaw, green curry simmer sauce, samosas, frozen pizza, coffee, plantain chips, yogurt, etc! My kids love picking their lunch snacks there as well. So good. Loved this post! Ugh! Now I am needing a Traders Joes trip! Even though it is 50 mins from my house! Guac is the best!! Trader Joe's is a favorite for sure! Their flowers make me so happy. Try dipping green apple slices in cookie butter. It sounds weird but is so good! Love TJ! So many of our same faves made your list and can't wait to try the others! My husband is a Cookie monster and we are obsessed with Joe Joe's in our house, they are so much better than Oreos!!! And they just came out with a mocha version that is amazing. Plus Joe Joe's n Cream ice cream! We put the cookie butter on warm brownies, waffles, pancakes, ice cream, and pretzels. YUM! Okay, I'm making a list of things to try at Trader Joes! These sll look great! A lady I work with always raves about the belgian butter waffle cookies with the cookie butter smeared on....I have tried the cookies and they're good! I just posted the same thing! Yes!! The closest one to me is Indy and my daughter lives there. I think I need to go visit my daughter and purchase some of your suggestions. LOL I need some of that mac and cheese comfort food this rainy and cool Wednesday in northern Indiana. Yes! I buy all my fresh flowers there, especially when we are having a function in our home. I am not a fan of the cookie butter either... BUT the cookie butter ice cream is amazing!!! Love today's post, we don't live close to a Trader Joe's but when we travel and see one I stop. I love cookie butter, the first bite I wasn't sure but the more I tried it grew on me especially on bananas. We don't have a local TJs, but drop in whenever we are near one. I love the options and prices. Try your cookie butter on Ritz crackers.....something about that sweet and salty combo is addicting! They have the absolute best dolmas (greek, rice stuffed grape leaves) in their olive and pickle section. They are oil packed, and so delicious with roasted red peppers and some sharp cheese. My daughter and I swear by this as our favorite snack. And I am with you- the cookie butter escapes me- ugh! Oh man! I love a jar of Cookie Butter. My husband and I literally fill a plastic spoon with a scoop of Cookie Butter and have it as dessert at night; just plain. We'll say to each other..."Want a CB spoon tonight?" LOL!!! The closest Tjs to me is 35/45 min away, so I go about quarterly and get our favs. Love the cheese puffs, dark chocolate Pb cups (the cookie butter cups were even better! ), always get coconut oil spray, and they used to have this AMAZING sweet and hot mustard that they discontinued but we would buy severa at a time. Grrr. We like the chocolate cookie butter on waffles in the morning. Our Publix (local market) has been getting a lot more stuff like cauli rice so I don't go to TJs as often anymore, but I still make a trip whenever I'm in the town where it's located. I agree with cookie butter on Ritz crackers. The salty and sweet is delicious! You have me wanting to leave work and head to TJ's! The closest one to me is about 25 minutes away but sounds like it's worth a trip. TJs makes these awesome Chili Chicken Lime Burgers that are sooooo good. Also these half popped popcorn kernels - I LOVE them. I am still scratching my head on the cookie butter craze, too. But, some TJ staples in our house are mandarin orange chicken, frozen veggie fried rice, frozen scallion veggie pancakes, edamame hummus and pumpernickel pretzel sticks for dipping, cowboy bark (don't try it - you'll be addicted! ), peanut butter fiberful bars and we love all of the $1.99 seasoning grinders. Scoop some cookie butter out and warm it up in the microwave then put it over sliced strawberries! AMAZING! Also you must try their pizza crust in their deli section with their sauce! SO good! My favorite item at TJs is actually the frozen garlic (they also have frozen basil). I HATE chopping garlic and the frozen squares are 1 clove each and you just put them into the pan when you are cooking (like a stir fry or sauce or whatever). They are in a little red container and are a life saver if you want to cook from scratch. One year I got Trader Joes cookie butter and their AMAZING Belgian Butter Waffle Cookies to eat with them as a gift from a student...I seriously couldn't stop. It was a perfect combination!! Here's a pic I found real quick of what the box looks like. I wish I had a TJ closer to me! In reality it's probably not *that* far from me but I can't seem to make time to get there. I loved this post! I also love the quick meals you found there and your honest opinion. Cooking after a long day of work is for the birds! I love Trader Joe's!!! If you haven't already you need to try...the broccol/kale bag of salad mix, Turkey Meatballs, Turkey Corndogs, Mini Churros, , Mini ice cream cones, Dried Baby Pineapples, Frozen Roasted Potatoes, Any of the chicken sausages, veggie spring rolls! Almost everything that is "dry food", you can open the bag and sample before you buy! If you don't like it, they will use it as samples for other customers! Yes, we love the frozen croissants!! Delicious and so much cheaper than buying at Starbucks or in a bakery! The dried pineapples are like candy - so so so so so good! And JUST dried pineapple so I get my sweet fix and no guilt! Plantain chips, dark chocolate espresso beans, and everything you mentioned! We don't have one in College Station so anytime my students make their home and back to Aggieland, they ask what I need and deliver all the goodies! I love this post!! Cookie Butter ice cream is just about the most delicious thing ever! Chili lime chicken burgers are great, I typically chop it up and eat it over rice. At Fall all of their seasonal pumpkin items always land in my car, always! I love/hate you for posting this.. I have my favorites, but as I was reading, I was like, "oh, that looks good.. that looks good..." I have a feeling my list will be growing :). I love love love their Pub Cheese with Jalapeños. It goes straight to the toosh, but is a great PMS-reliever. Highly recommend. Dip pretzel sticks in your cookie butter! Oh how I LOVE TJ's!! ❤️❤️❤️ I always get their turkey meatballs, chili lime chicken burgers, creamy cilantro salad dressing, and those chocolate chip dippers!!! Yum! We love their pizza dough, lemon bars, and breakfast snack mix too! I can't wait to try those cinnamon apple straws! O nooo so sad to hear about the Cookie Butter!!! I love it on toast, but if not, as a plus or a frosting on top of or in cupcakes?!??!? Cookie butter is amazing on tortilla chips. Sounds funny but the sweet/salty combo is where it's at! I really need to start making the trip! My father-in-law was just converted thanks to the Dunkers cookies you mentioned so at least I'll have a buddy to go with me! I am totally with Sheaffer on the dried mangoes. They're my newest TJ's obsession. I also love their flax seed veggie tortilla chips (particularly great dipped in their greek yogurt and spinach dip). Their big sparkling water bottles are another favorite, as are their cauliflower rice and the frozen Indian meals for my work lunches. The frozen paneer tikka masala meal is incredible. I was skeptical but now I buy like 3 at a time. I also like the gnocchi in gorganzola sauce frozen meal and the lemonade is so good. 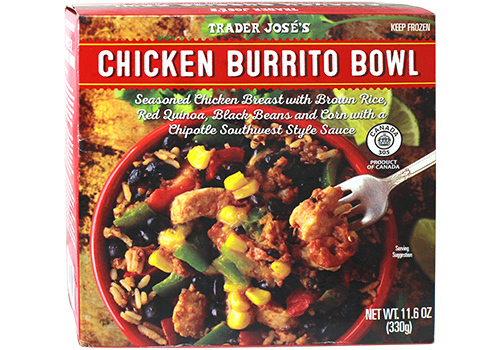 Also I like to look at the "what's good at Trader Joe's" blog from time to time to get new ideas. Sorrry, one last thing--their Midsummer Night's Cream pump. It's really, really great lotion and crazy affordable! I worked at TJs (until I retired and started traveling too much) and got addicted to so many of their fabulous, delicious goodies! Plus, it is just enjoyable to shop there because they know how to treat their customers! Try their Kringles during many of the holiday times (bakery section) ~~ they are to die for warmed in the oven ~~ and you can always try different foods that they demo in the store all day long. They have great wine prices too! And love their return policy. Love their 99 cent greeting cards! Thank you, Trader Joe's for coming to Boise! My favorite store by far! I love that you own up to eating/serving some frozen meals and processed foods. Girl, you are tops on my list! The peanut butter cups are my favorite too! So good and hard to stop at just one! I don't believe anyone has mentioned it yet - cookie butter is delicious on top of oatmeal!! The pumpkin cookie butter in fall is amazing! I eat it off the spoon, or on toast. Never tried the regular, I just wait and stock up 😋! Thanks for the other tips! We have a Trader Joe's in the same shopping center as target and Costco but I rarely go in there. The one thing they sell that I do love is the thin dark chocolate covered pretzels. They are amazing! For some reason, Trader Joe's overwhelms me, but having some items to look for will be helpful! Try their gluten-free chocolate cupcakes with white frosting - SO GOOD! You'd never know they are GF and you can get a 4-pack for $4 - a steal for this type of item! We love the Chocolate Brooklyn Babka. It's a dessert bread that's swirled with dark chocolate and covered with mini dark chocolate chips. I think it's a seasonal item so it's not always available. The dark chocolate peanut butter cupcakes are sublime. Have a glass of milk handy! If you like sparkling wine, try the white or red Lambrusco. I pick up several jars each of the red and green salsas every time I go. I don't think I could live without Trader Joe's! Well I has have a post like this on my list for the near future. If you haven't tried the frozen cauliflower rice put it on your list this week. I've used it alone and it's fine but if you mix it in with rice (for say your frozen Asian chicken dishes) it's PERFECT. You don't even notice it. Great way to cut the carbs and get more veggies in the kids. I love Trader Joe's for their flowers, cereal, salsa, cheese, their shaving cream (the best! ), and seasonal food. Their peppermint hot chocolate mix with a shot of espresso is better than any Starbucks peppermint mocha! I didn't understand the hype either until I went for the first time and tried some things. Now, I couldn't live without it! If you have the choice between Costco's and Sam's Club definitely do Costco. We have both and I'm having a hard time dropping my Sam's (because their staples are cheaper and their CC a better deal) but if you like Trader Joe's stuff than Costco is the way to go. The closest to us is 3 hours away and I have literally made my husband go out of the way on the way home from a trip to go. Cookie butter is best on a spoon in my opinion. Or toast. And now I obviously need to go back ASAP to get all these things. The cookie butter sandwich cookies are amazing. I forgot exactly what there are called, but...wow. I am still a skeptic about Trader Joes only because we do not have one near us so I haven't gone. HOWEVER, I have tried their "Italian Truffle Cheese" and it is AMAZINGGGG. I have never tried the regular Cookie Butter but have tried the Ice Cream Cookie Butter which was crazy good as well. But seriously the cheese... get it next time. I am not a cheese person at all. Only the basics from the grocery store. 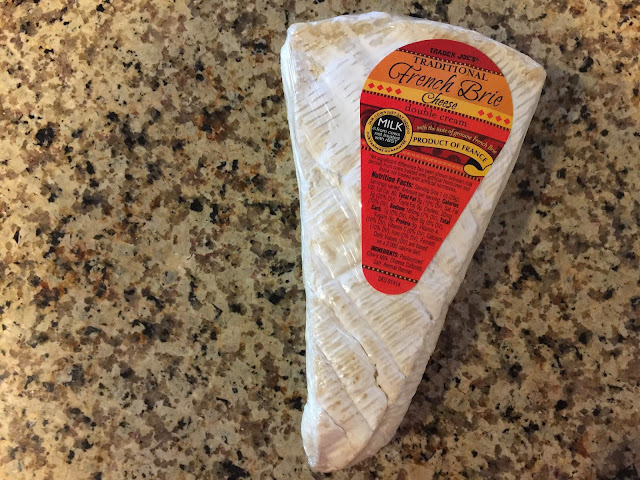 It is hands down my favorite cheese, especially on crackers! You have inspired me to try it out!! Ours isn't super-convenient either and the few times I've been in I've been overwhelmed. Gotta try some of these suggestions though. Trader Joes is our Fave! It is where I do the majority of our shopping. Their prices are great, no food dye, additives, high fructose corn syrup, etc. Your picks are faves of ours as well. I would recommend their unexpected cheddar cheese. It is soooo good. My daughter calls it 'special' cheese and we both cant get enough. I serve it with their balsamic glaze drizzled over a chunk of cheese on their wheat crisp crackers (like a wheat thin , but less heavy and less greasy). All of their pasta, PB filled pretzels, salads, wraps, mini ice cream cones and bon-bons, ice cream...sooo good, their frozen pizzas are staples for us and in the summer they have a strawberry mango pizza, (if I remember correctly) that is so refreshing and good. crispy chicken pkg, cheerios versions are way better than actual cheerios. everything is just better tasting because it does not have the 'junk in it. I recently fell in love with their peppered turkey bacon; I add it to my breakfast (egg white veggie scramble with sweet potato and TJ's 21 seasoning), BLT, any sandwich or salad, etc. Their flavored meats are sooo good. So much flavor. Cinnamon rolls, restaurant style tortilla chips, peanut butter, and I agree on the preserves; we also buy that strawberry preserve as well as raspberry, and they are so so good; We have never liked jelly because...ew, gross...fake! As an adult I figured out why I didn't like jelly as a kid. Yuck. I could go on and on, but you are pretty safe to try anything there. Great store. Get the '21 Seasoning Salute' --- it is awesome to sprinkle on meats, veggies, salads etc! I roast meat and veggies w olive oil and this seasoning - so good! Yes! Love it here too! 21 Seasoning Salute is the best seasoning ever! I use it on everything. Can't wait to try some of your favorites! You seriously need to try the croissants (freezer section). Life. Changing. We love the chocolate but the almond are great too. Ooh I will have to try some of those! Other faves of mine are their Shrimp Stir Fry, Thai Shrimp Fried Rice (not the healthiest so I use less oil), also their Thai Red Curry sauce over chicken/rice for a quick dish. A lot of friends of mine adore their mochi ice cream but I am not a big fan myself. 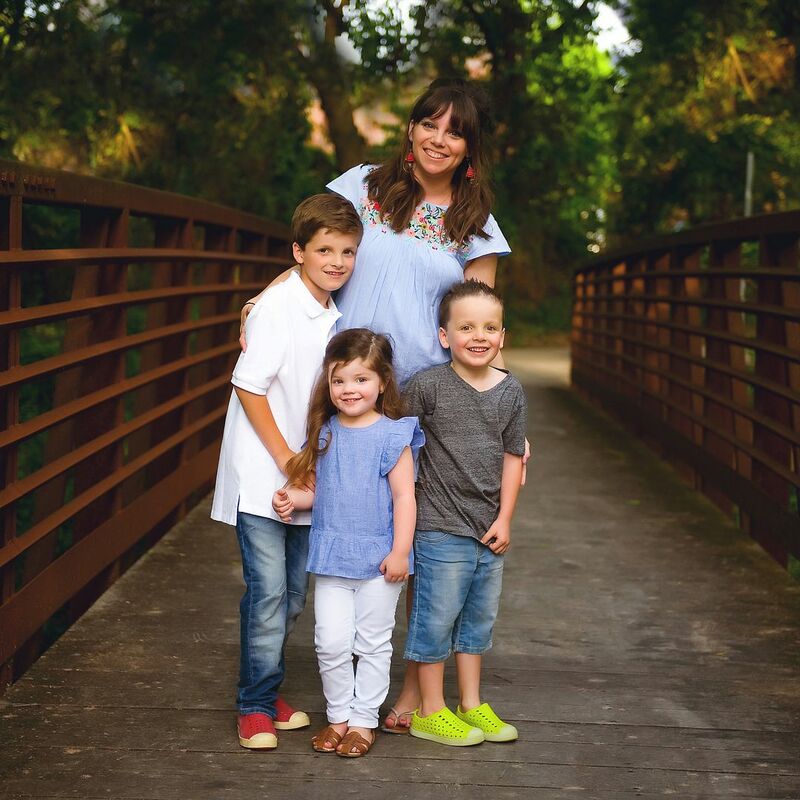 we love their chicken fried rice in the frozen section, gingersnap cookies, frozen cauliflower rice, frozen mac and cheese, hold the cone ice cream (perfect size for little hands), their 99 cent cards are great too! not sure if you aware, there should be a Pelican hidden in all TJ's and if the kids find him, tell the cashier and they get a lollipop. Our favorite go-to meal is their frozen party meatballs, one jar of mango chutney and one jar of their marsala simmer sauce; throw all in crockpot for a few hours and serve over rice or pasta. It is absolutely delicious!!! We LOVE Trader Joe's, and they have the nicest employees! Our favorites are their Kalamata Olive Hummus, Reduced Guilt Guacomole on top of their Quinoa Cowboy Burgers (SO Good, I buy 4 boxes at a time for fear of them running out), Organic Marinara with their frozen Mozzarella Sticks, Vodka sauce, their refrigerated pizza sauce is so good and I can eat it by itself by the spoonful, Frozen brown rice, frozen Naan, I love their Antioxident Facial Serum, Cornichons, the list goes on. So many good things and my kids love finding the bear and getting a lollipop. Cookie butter on fresh waffles with a sprinkle of powdered sugar!! Life changing!! Honestly I prefer the Biscoff Cookie Butter I pick up right at Target. So yummy!! Coconut body butter for $5.99 versus $20+ at Body Shop! I wish we had one closer. I have to drive to Fresno, Ca and its only 45 minutes but eh. I hate it. I have an ongoing list under my Notes and I will be adding a few of your "must haves"! Have you tried their tamales (near the salads)? So, so good!! I'm so jealous of all of you that have a Trader Jo's so close! Ours is about 130 miles away in the suburbs of Chicago😕 I'm bummed because we were actually up that way last weekend and never thought to hit Trader Jo's. I mean, who goes to a grocery store on vacation? Well, next time we are!! Thanks for all the great ideas! Our Trader Joe's has the TINIEST parking lot (like, drive around 3 time and hope someone leaves so you have have their spot tiny), so I almost never go. But this makes me want to give it another try. I think the key is getting there in an off time of day. Also, I live in Florida, so in the winter when the snowbirds are here...forget it! But they should be heading back to their home states soon so maybe I can go places again soon. I am a BIG fan of the going bananas frozen bananas. They are chocolate covered and the best with just a little peanut butter. I always keep a bag of the frozen chicken fried rice. I also love the frozen turkey corn dogs. They are fab! When I go to my sister's house in Leawood, I always stop at Trade Joe's! OH MY GOODNESS! What a great store. We do have an Aldi in Topeka, KS (which I began loving when I went to Europe - why can't America take a lesson and have us pay 25 cents to get a cart! No more leaving carts in the parking lot!!!) and Aldi is also wonderful. They have things that NO one else has and I buy weekly. Now you have me wanting to try that cookie butter! yummmmmmmm.